Notes: In a slim 6HP format the Rebel Technology Tonic offers one adjustable and five fixed intervals. Each interval has a trigger input and manual trigger button. Freely combine intervals for more than four octaves chromatic range. The default tuning gives you whole tone steps: +2, +4, +8 and +16 semitones. The bottom, negative interval drops the pitch by a semitone. This provides a basic range of 32 semitones, not counting the adjustable interval. 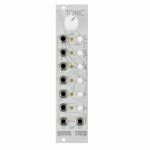 The module is entirely analog, each interval can be tuned using the 23-turn precision trimpots on the back of the module.